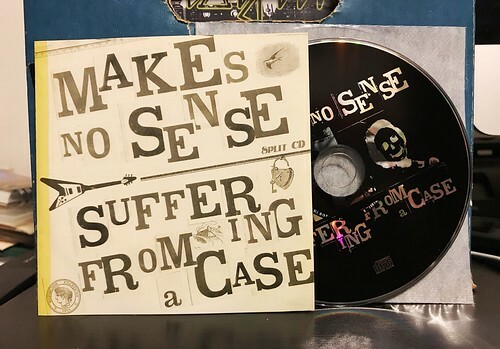 This split CD features two Japanese bands, Make No Sense and Suffering From A Case. It came back all the way in 2007 so it's another one that I've been missing out on for quite some time. Luckily I have it now. Makes No Sense immediately reminds me of Cradle To Grave, especially in their first song "Chunk of Contradictions." The way the band effortless changes tempos going from ten thousand miles an hour in the verse to a steady backbeat of a catchy chorus is pretty remarkable. Though I actually prefer their second song on the disc, "(Not For Me To Decide) Your Choice." The tempo is a bit more consistent throughout the song and it just delivers the sort of scraggly, high energy Japanese pop punk that I know and love. It looks like these guys have a couple of other split CDs out and now I need to find them as well. Suffering From A Case is a band I'm more familiar with. Actually, it's funny as I ended up with three copies of their other EP on Waterslide. I picked up a copy back when it came out. Then while I was in Japan I ended up buying another copy of it. Finally, I ended up with a third copy as someone from a distro tossed it in with a Brown Trout album I bought. I found loving homes for the extras, don't worry. So for the two Suffering From A Case songs on this split they deliver excellent, Dillinger Four style melodic punk. Energy, flashy breakdowns, bashing octaves and shouting their hearts out. Excellent stuff and I recommend picking up their EP as well if you don't already have it and I didn't give you a copy.